Ring In the New Year with Twice the Fun! One Event, Twice the Fun! Give yourself twice the fun and twice the New Year’s Day with Celebrate Twice! Whew—try saying that six times fast! 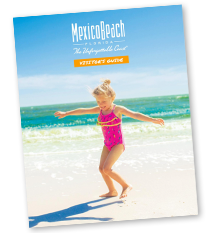 Mexico Beach and Port St. Joe’s coastal villages will have you stylishly celebrating the New Year (twice) in the best of ways. Two different time zones, a pop of the champagne, and a big bang of a firework show! 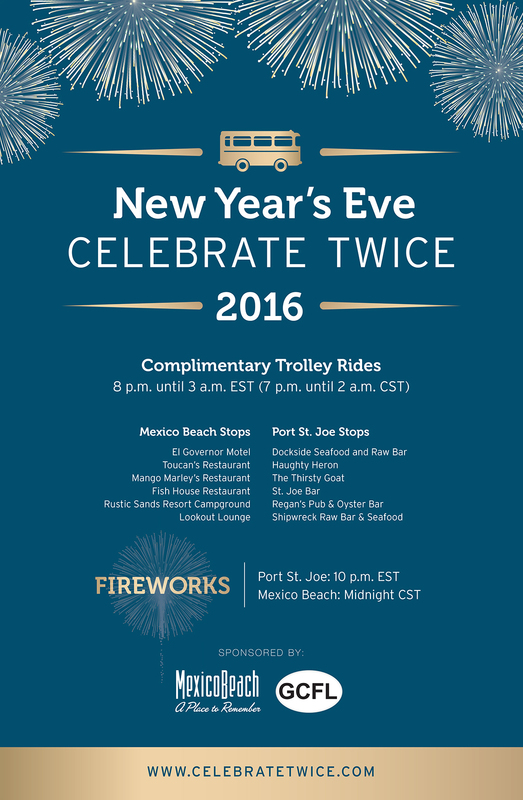 The annual “Celebrate New Year’s Eve Twice” offers a complimentary trolley service that makes regular stops at 12 bars and restaurants throughout the two towns allowing guests to celebrate the countdown to 2016 in the Eastern time zone (Port St. Joe) and Central time zone (Mexico Beach). That’s right! Everyone can enjoy themselves and have fun without worrying about who will be left as designated driver. The idea behind this popularized annual event, Celebrate Twice, was created by Mexico Beach of CDC and the Gulf County TDC to provide celebrators and event goers a unique, fun, and safe experience to go from one town to the other, bar to restaurants, without drinking and driving. The worry-free event will start off with a scavenger hunt during the day to enjoy New Years Eve with the family, while the nightly celebration will consist of a free trolly ride, stopping at six different locations, giving you access to 13 bars and restaurants, and ending the night with fire works. Start the day off by celebrating with the kids and the whole family at the New Years Eve’s Scavenger Hunt! Complimentary New Year’s Eve promotional (and helpful) party favors from businesses local to both Port St. Joe and Mexico Beach will be given to ring in the New Year (twice of course). Each businesses will punch your card to verify the collection. As always, enter in a chance to win a free 2-Night stay for Celebrate Twice 2017 when you hand in your completed scavenger hunt card to either the Gulf County Welcome Center or the Mexico Beach Welcome center by 2:00pm – making it a hunt you won’t want to miss out on. Make your New Years 2016 a time to remember and Celebrate Twice with us! We’d love to have you here!